Enticing children into a dark cave full of bats took more effort than I expected. 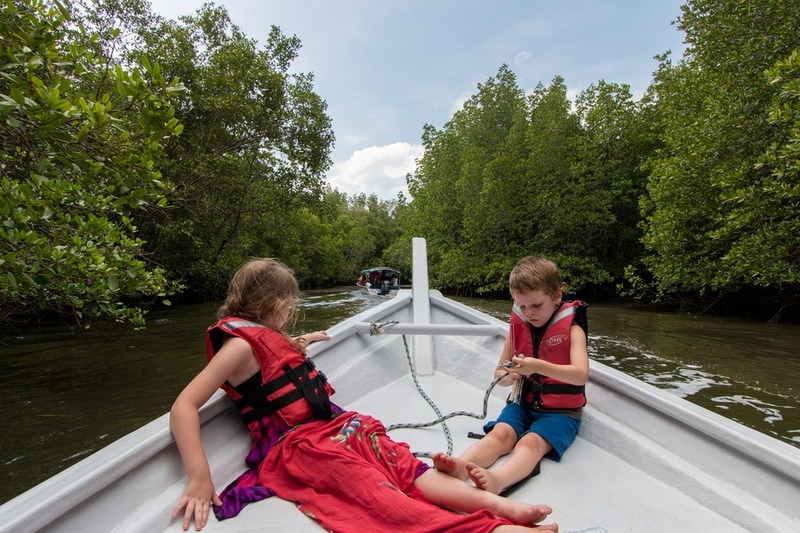 Dense tropical mangroves trace winding rivers throughout the northeast region of Langkawi, Malaysia. 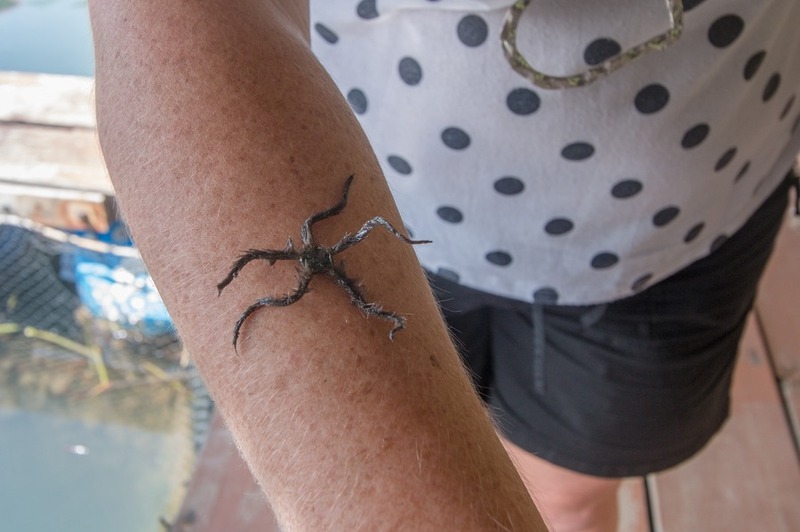 Here you can find plenty of operators offering tours to get up close and personal with the island’s natural beauty. We started our morning at Tanjung Rhu jetty, which is much quieter than the popular Kilim jetty. Still, Tanjung Rhu was fairly busy on the day we went, but we didn’t have to wait long before it was time for our boat ride. 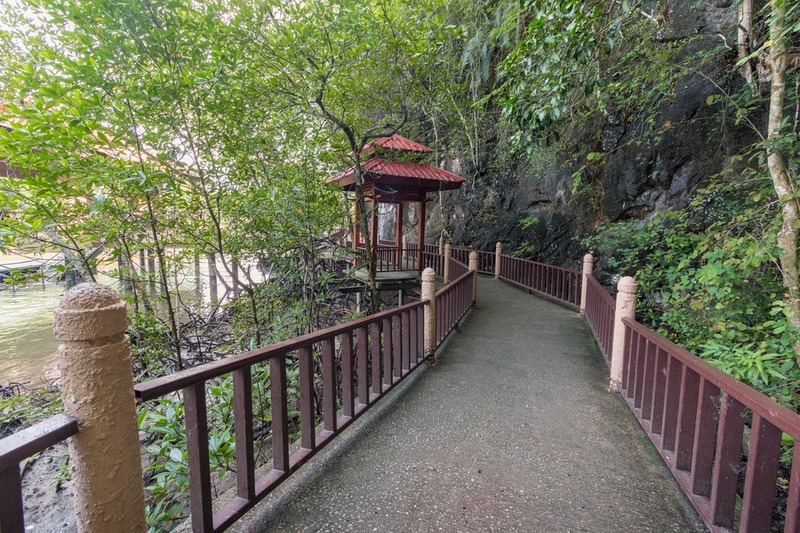 Take note, the toilets at the jetty are paid, but don’t expect “paid” facilities. Most of the public toilets in Langkawi are squat-style with no toilet paper and almost always are soaking wet. Restaurants and hotels are usually your best bet when nature calls. 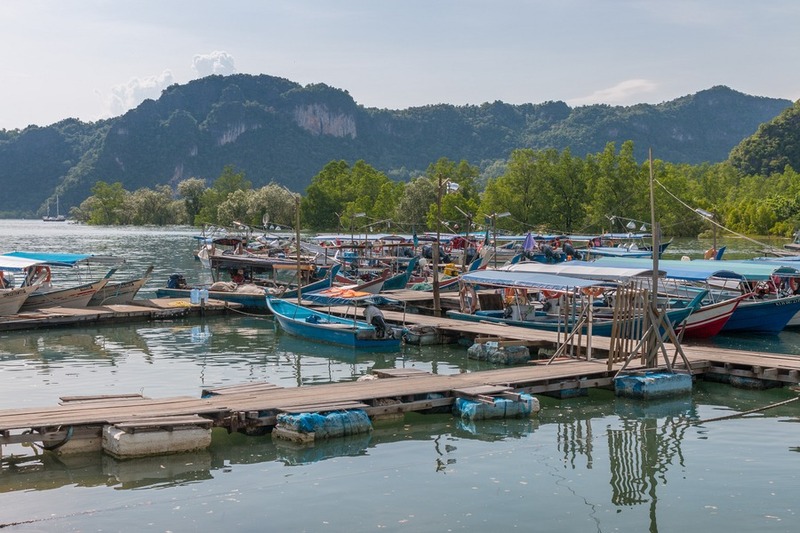 The Kilim Geoforest Park, part of the UNESCO-endorsed Langkawi Geopark, is spread out over 100 sq km and features striking contrasts from well-protected flourishing mangrove forests to isolated alabaster-hue sandy beaches and deep beryl-tinted lagoons. 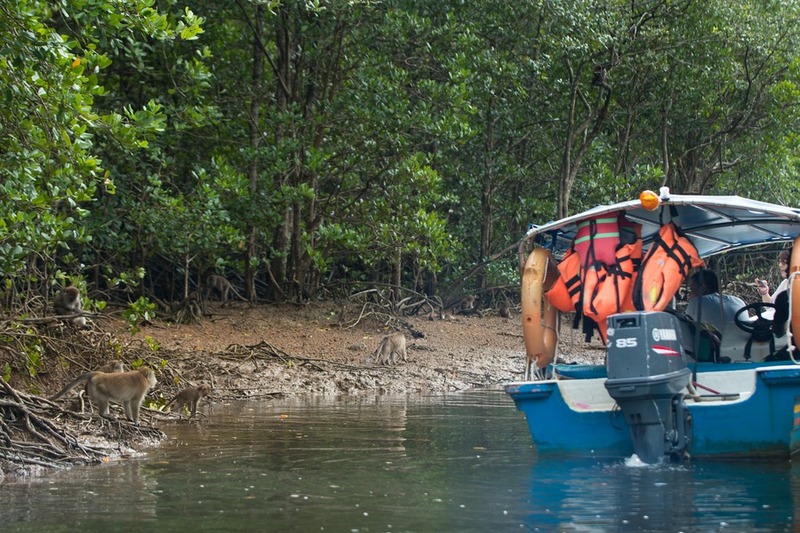 Our boat cruised through the mangrove forests with their over-hanging Bogak Trees. The water was calm, and the wind was still and the forest was serene. 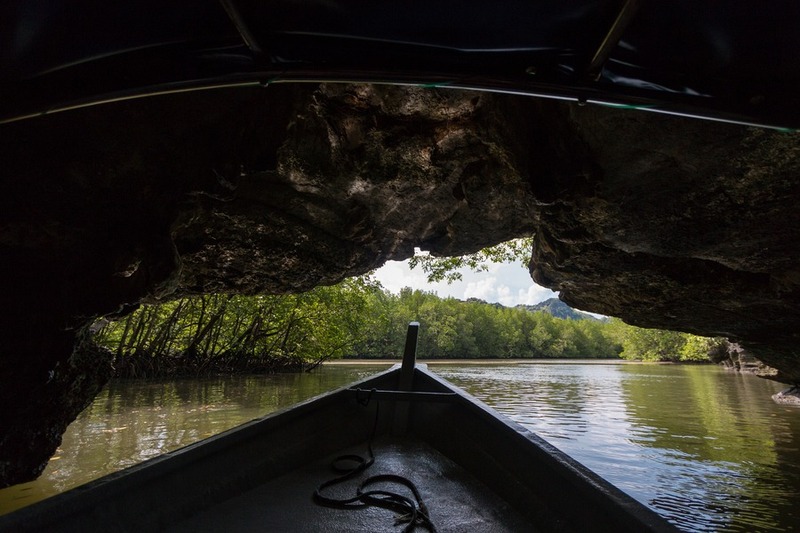 This area is home to one of the best-preserved mangrove forests anywhere in the world. 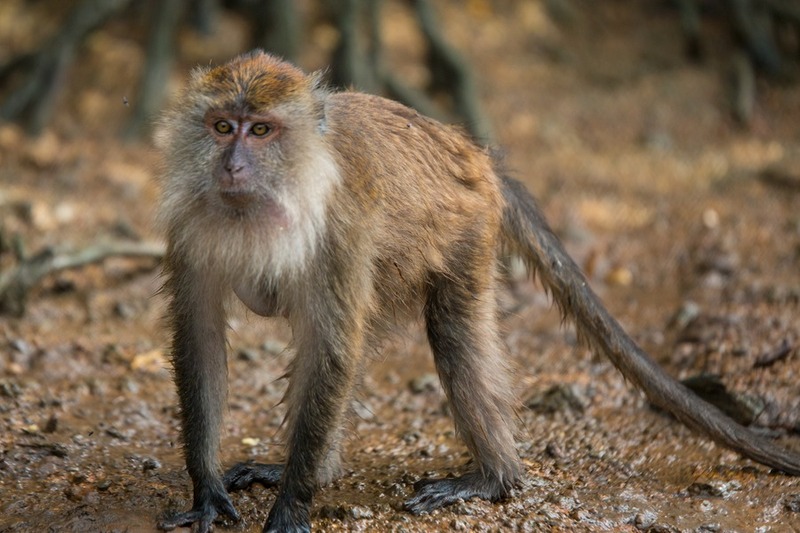 We spotted monkeys on the water’s edge waiting for food-laden tourists – watching us with their beady unblinking eyes. But there was no chance of getting a free lunch from us. 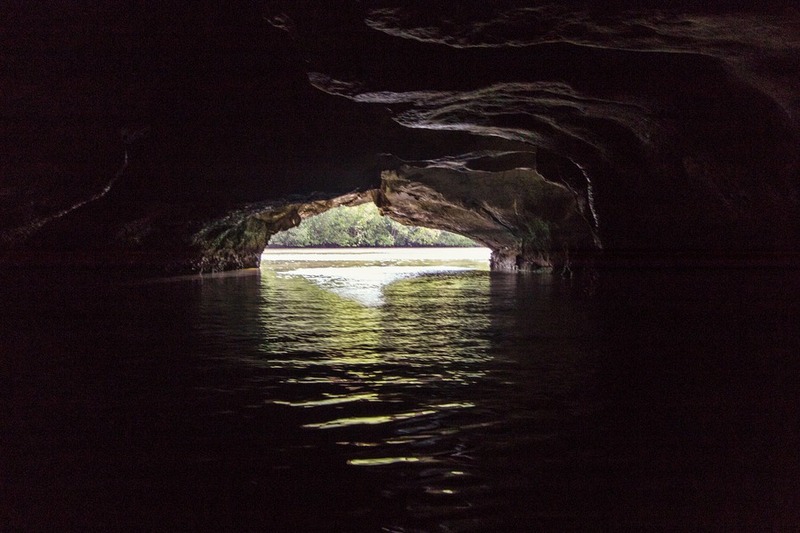 As we continued, the boat captain pointed out unique limestone rock formations, peppered along the tour trail. These required a little imagination to appreciate their given names (such as “Turtle Rock” and “The Shoe”). 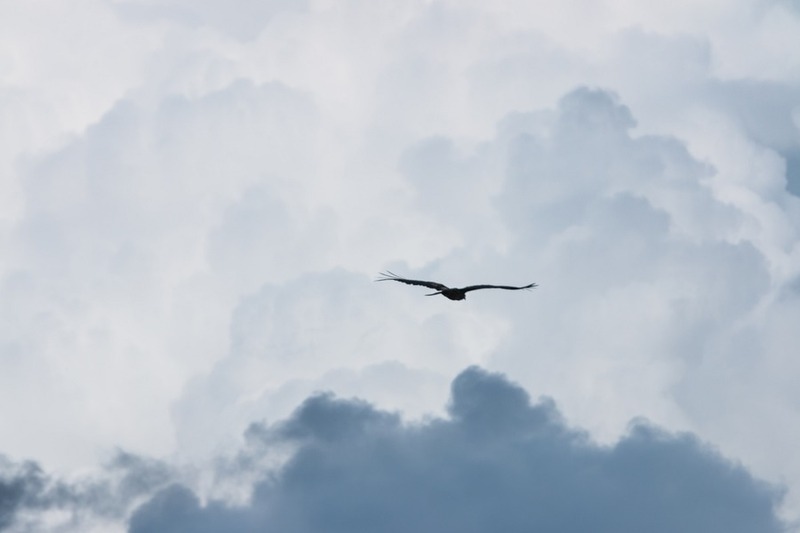 The boat stopped briefly near “Snake Island” where we watched White-Bellied Sea Eagles circling high above the tree line, searching for their next meal. I could have watched them for hours. 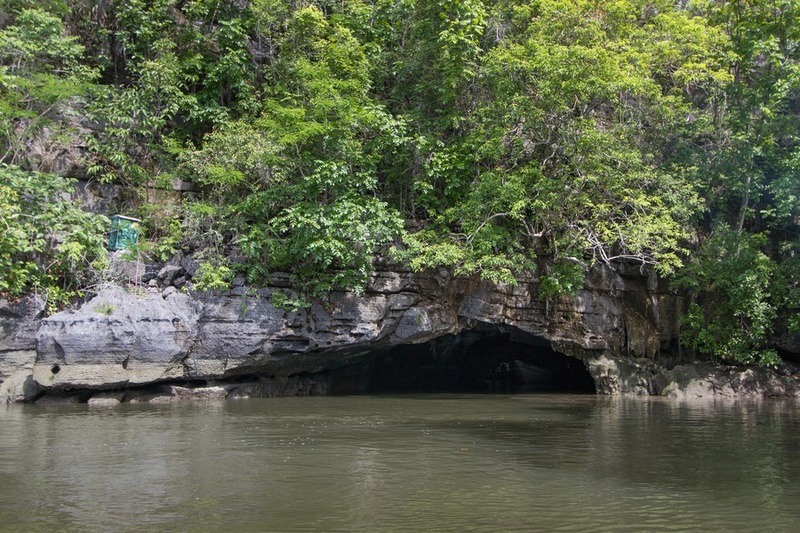 Next, the boat voyaged through a low limestone natural tunnel named “Crocodile Cave” (Gua Buaya). It was dim and a very snug fit. My hat goes off to the captain who was able to navigate effortlessly through the tight squeeze unscathed. 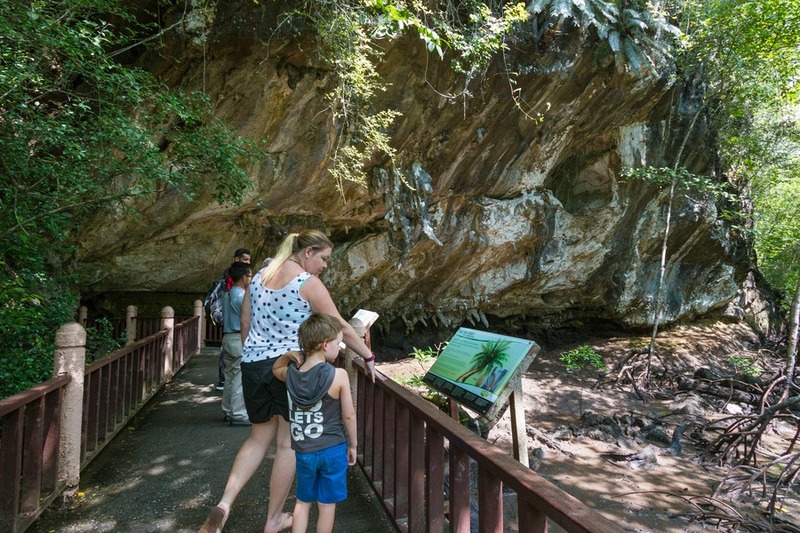 Out the other side we spotted the namesake rock formation before continuing to explore Gua Kelawar – the Bat Cave. Alas comic book fans, Batman doesn’t live there; it’s named after it’s Malaysian Fruit Bat population. 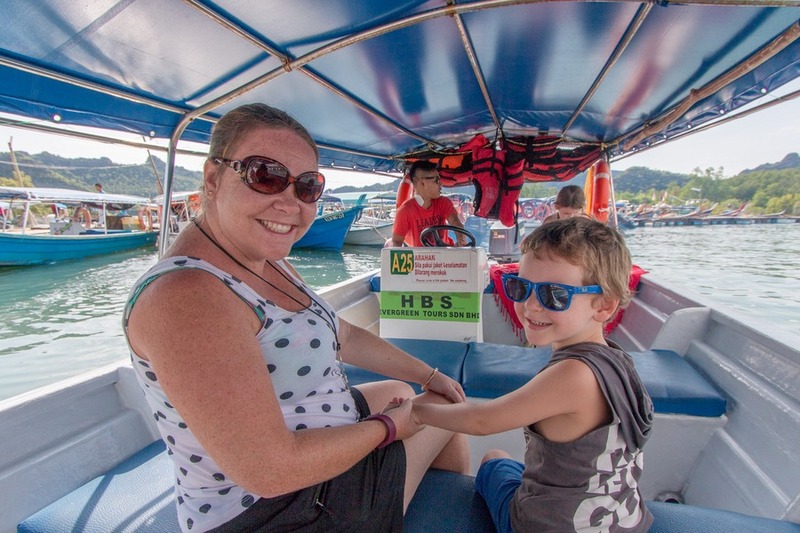 The boat dropped us off at a floating wooden footbridge where our guide paid the entry fee. 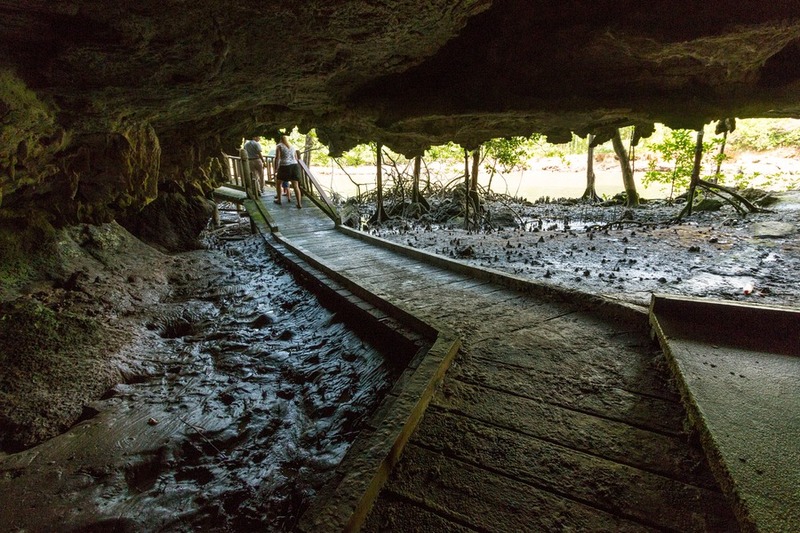 We followed the walkway through the mangroves to the entrance of the Bat Cave. The interior was dark and almost creepy. I had to duck at the low entrance, so imagine my contortionist 6 foot 9 (205cm) husband. He puts the bend into Bender. Our guide passed out torches to shine at the ceiling, but as our eyes adjusted to the dimness there was enough natural light that we didn’t really need the torches. In typical kid fashion, our kids found these torches more entertaining than the writhing black bodies hanging from the ceiling. There were lots. And they are noisy and creepy. 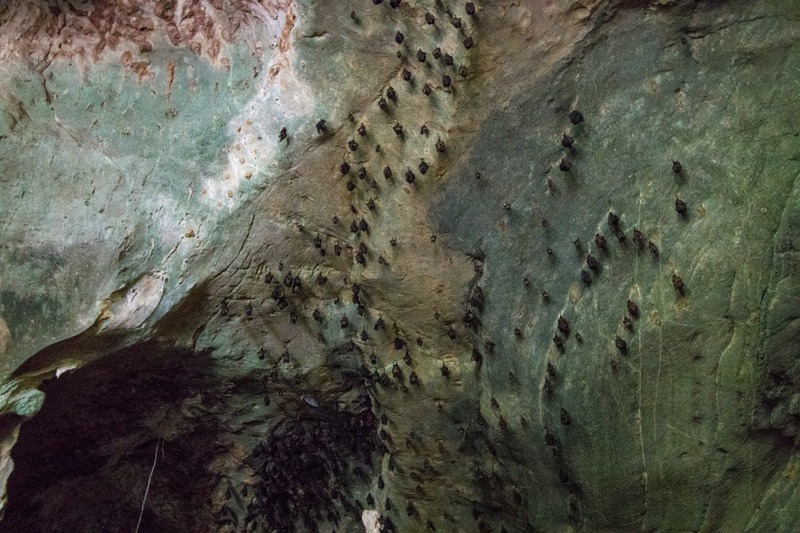 Once past the entrance the ceiling stretches to 10 meters in height, and between the stalactites hung more than 1000 bats. Woah! 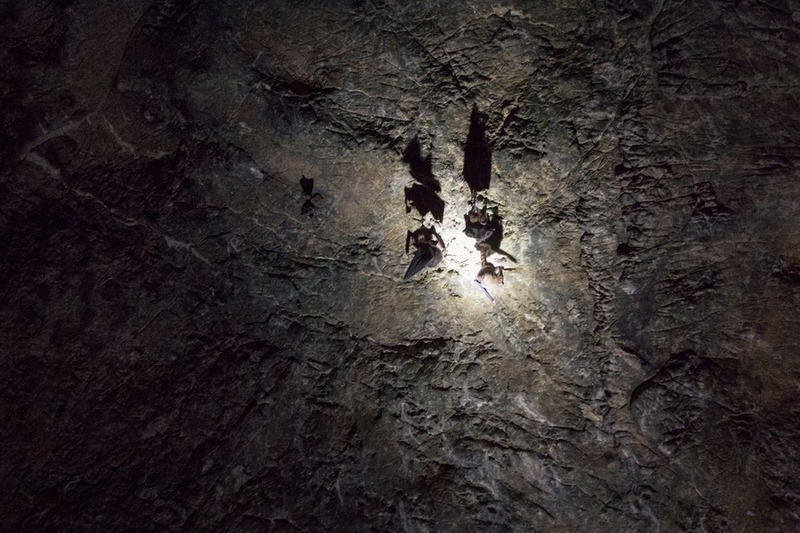 We tried to follow the footbridge through the cave silently so as not to cause a bat poop onslaught. We spotted the usual cave structures like stalactites and stalagmites and the columns of those that joined together. 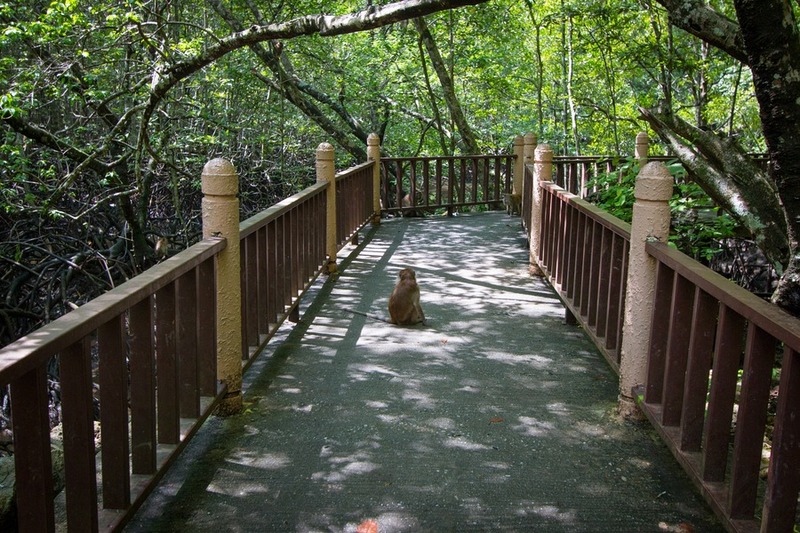 Once we got outside we continued to follow the wooden path through the mangrove swamps, past beautiful green foliage and scurrying monkeys eager to get their mischievous fingers on something tasty or shiny. Our guide passed them a water bottle which they fought over while he ushered us past their thieving hands and scheming eyes. We were warned to put all hats and sunglasses in our bags. 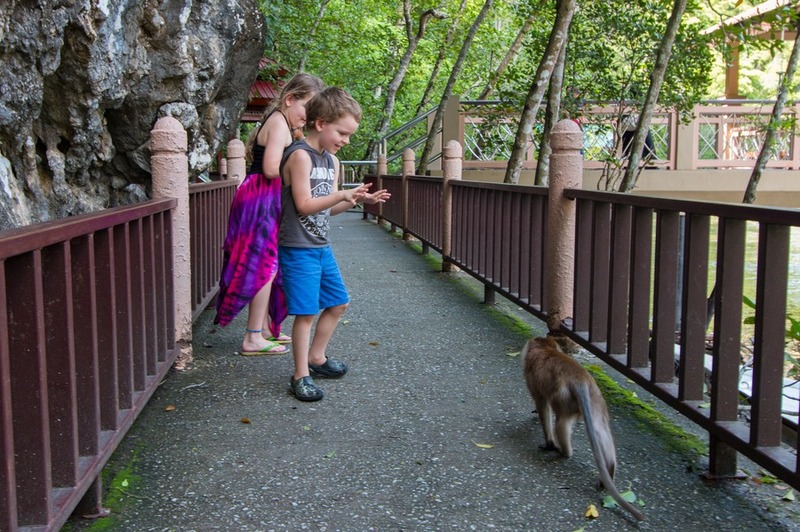 These monkeys didn’t seem as aggressive as those we met in Ubud, Bali, but they certainly weren’t intimidated by humans. 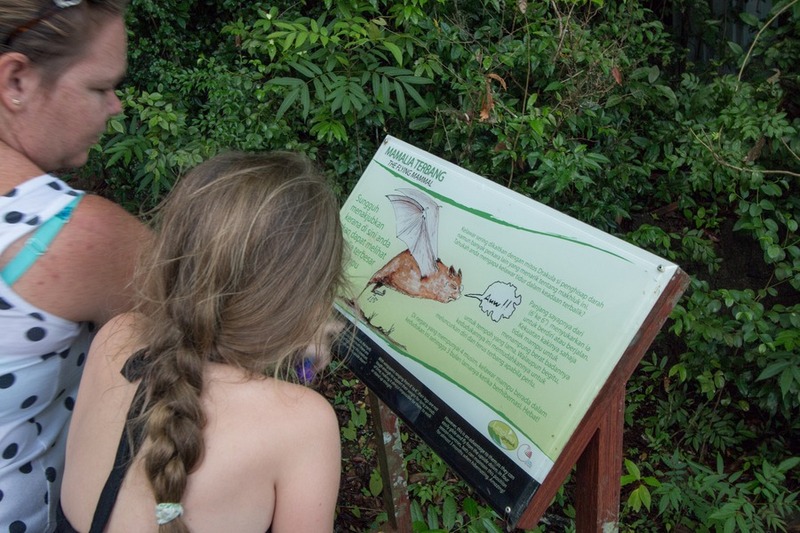 If you aren’t spending too much time running from the monkeys see if you can spot a fern-like plant known as a Cycad. 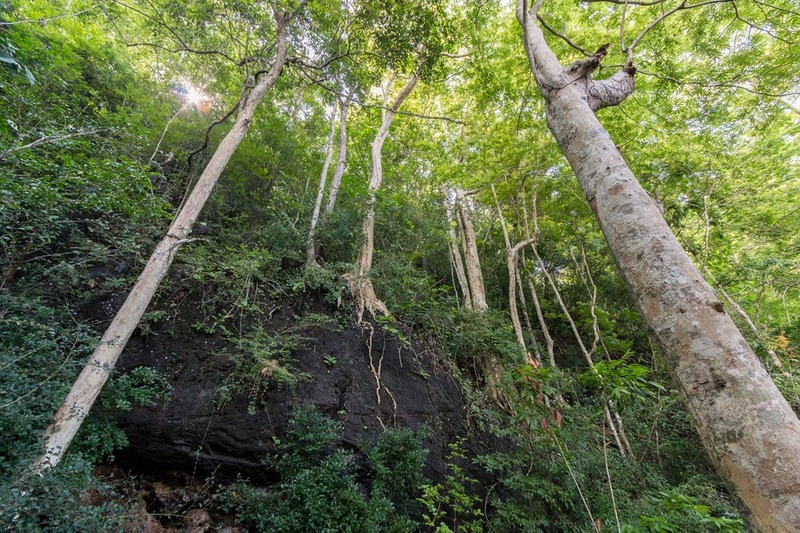 It’s a primitive plant believed to have existed over 200 million years ago, even before dinosaurs (although some scientists disagree). Out boat was waiting for us and carried us a short distance to a series of floating restaurants. 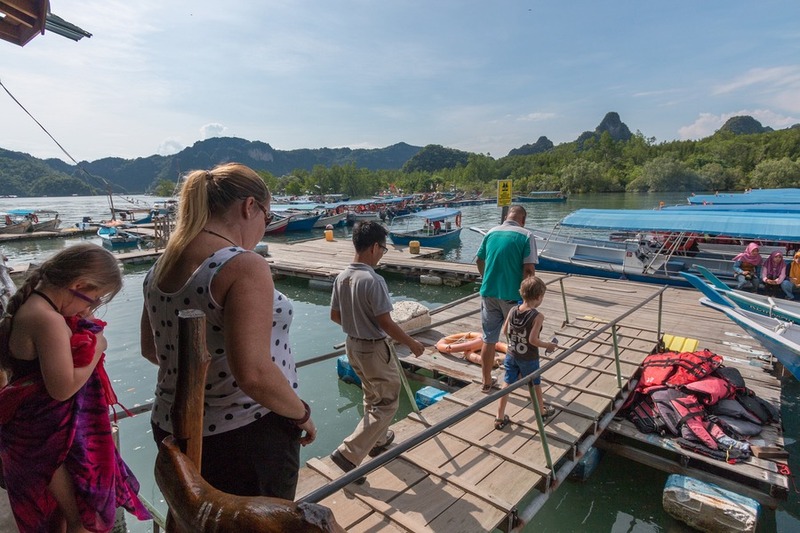 Our destination was The Hole In The Wall, which was the original floating restaurant in northeast Langkawi. 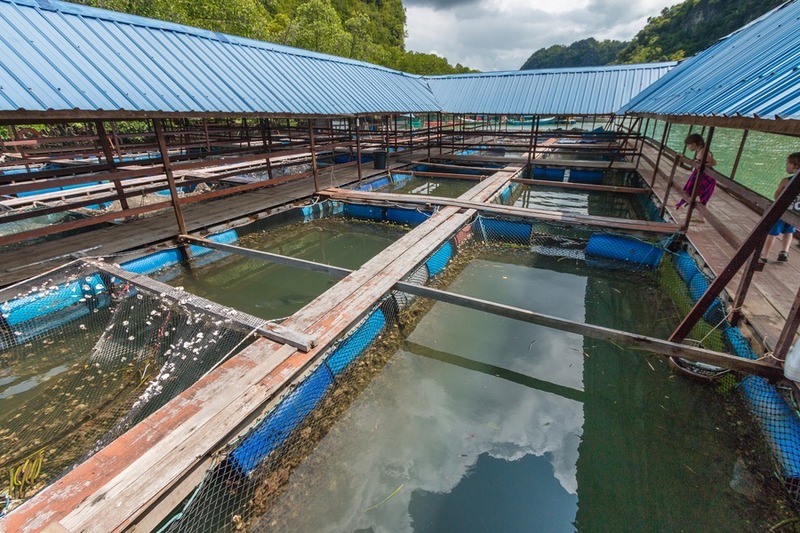 Before lunch we toured the accompanying fish farm with the help from a young lad. He introduced us to the different types of fish and our kids loved watching him feed them. We came to the stingrays and the boy slung fish guts over the side of the enclosure tempting the ray up to the surface so the kids could see it’s smiling face. The stingray lunged, sucking that fish down darn fast and in the same instant spitting all over my wide-eyed children who had stooped down to get a good look at him. We burst out laughing; the stunned (yet amused) look on their faces was priceless. My two soggy babies had been unceremoniously spat on by a stingray. Unforgettable moments. I wish I had been filming. 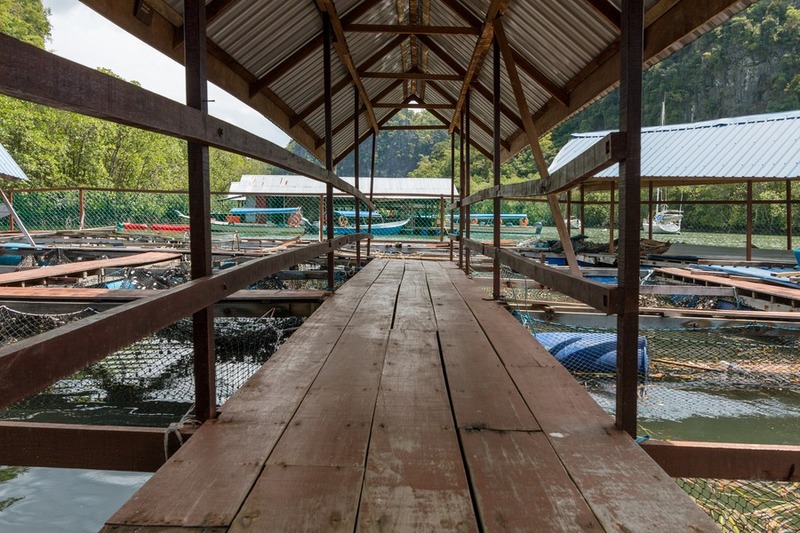 Toilet facilities were at the exit of the fish farm so we could wash up before heading to our table for lunch. We are not typically big seafood eaters, but the dishes were fresh and mostly unfishy. The fried calamari was delicious and my son devoured almost an entire grilled fish. With satisfied bellies we got back into our boat to return to the jetty via the open sea. Beautiful cliffs covered in a blanket of green greeted us as we pounded across the waves. We could even see Thailand on the northern horizon. The sea became rougher and the skies opened up with a drizzle as we neared our final destination. We arrived back to the jetty slightly chilly, so I’d recommend bringing along a jumper (sweater) just in case – even if you think it’s impossibly hot. 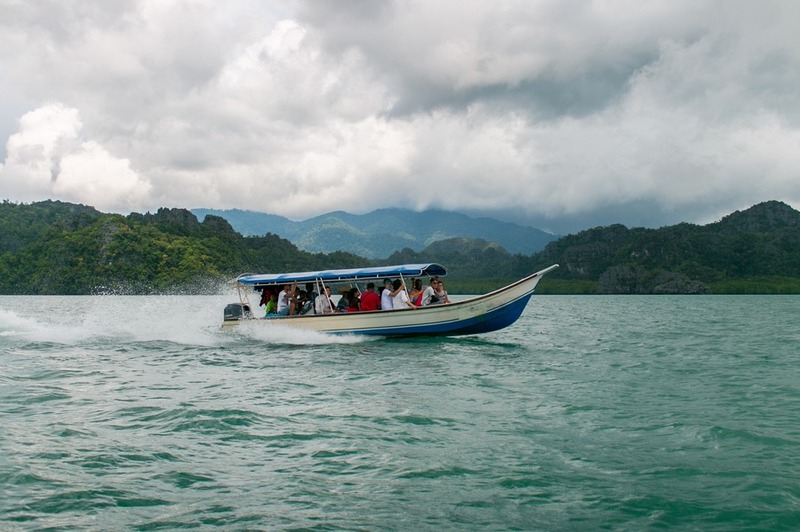 The weather can change dramatically and unexpectedly in Langkawi. 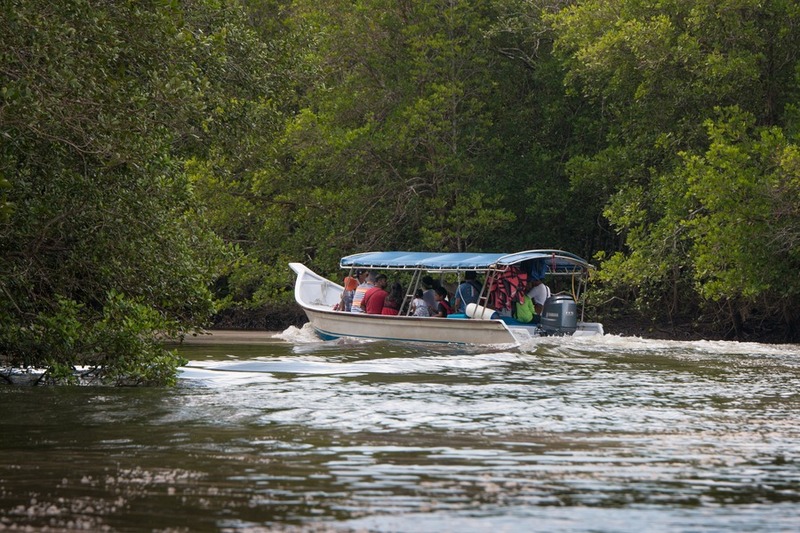 Our mangrove tour was a beautiful trip filled with sensational island views, unique wildlife and relaxation. 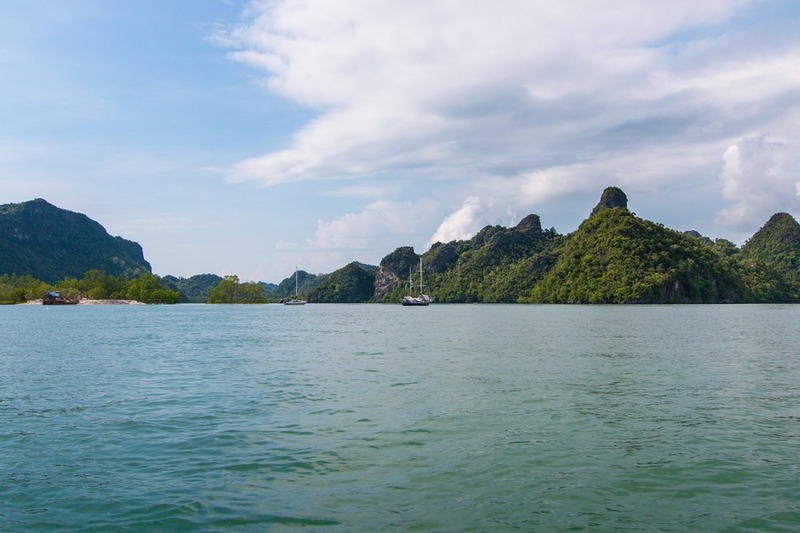 Definitely add it to your list of things to do in Langkawi. But the fish-gut-flavoured stingray spitting is totally optional. Such a shame you weren't filming the stingray but a happy/funny memory to treausre nonetheless. The whole trip sunds a great experience (apart from the public toilets maybe). Glad no one got hurt. The tour looked amazing!!! Looks like a fabulous tour and the food look great too. Not so sure I'd be up for the spitting rays! Were you out for a full day? Looks like a fun day! i can't wait to get my boys over to that part of the world! Was in Malaysia in 2001 and itching to get back! Did I miss the stingray part? Helpful write up! Did you bring your own lifejackets for the kids, or did the company provide them? In Vietnam, I always need to bring my own kids' size ones, but my little one has outgrown hers so trying to see if I can get away without buying a new one before our upcoming trip to Langkawi. Hi Erin. I'm going to langkawi in March. Could u please let me know the name of the tour companies for the mangrove tour and island hopping? TQVM!